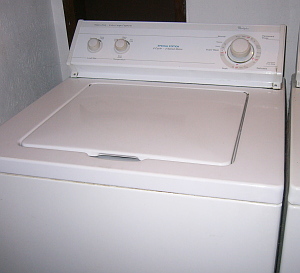 I have a heavy-duty extra-large capacity Whirlpool washing machine. This is the Special Edition with six cycles and a two speed motor, with the small and extra-large load size capacity's. It has four different wash cycles, a normal, permanent press, delicates and soak with two levels of load size. You can load in just a couple of garments to wash or fill the oversize drum with plenty of towels and sheets. You have options of warm, cold and hot during the washing and rinse cycles. As a washer it has given me no trouble in the last eight or nine years I've owned it and it is still looks brand-new with that basic easy to clean baked on white enamel surface. I feel it runs very efficiently even through it is the old traditional style that you load from the top, which I still feel very comfortable with. I believe my Whirlpool is a very nice standard washing machine that wasn't terribly expensive to buy, giving me very reliable service, while not coming with a lot of extra features I did not need. I'm sure there's some concern these days about how much more water is actually utilize in a top load as opposed to a front load washing machine. I know a top load uses about twice as much water as a front load washing machine, but I just can't justify the cost difference to buy one of the front load washing machines that I have seen, with this one still working and water being as cheap of a resource as it is. I feel very good about my Whirlpool extra-large capacity washing machine, knowing that it will probably last at least for another 10 years. I'm single and don't use it much, but it's worked great the last 12 years! The one issue I have is that when it goes into a spin cycle, there is a loud DINGING noise as the tub spins round! I can't figure out what it could be! I've moved the from side to side, but have no luck stopping it! Any idea?? Also, what kind of standard maintanence should i be doing on it to get more life from it? I have the same one. It's 17 years old. I love it And hope to find another to replace it. If it ever dies on me. What is the Cu ft capacity of model LXR6232E? Please help me find the cubic foot capacity for the Whirlpool Special Edition - LXR6232E washer machine. Thank you. Can you stack this particular washer and dryer? I have the LXR6232EQ0 and had a leveling tab fall out from under the drum support. I had to tip the washer to replace the plastic & rubber pieces that connect the motor to the transmission. thats when the tab fell out. A few months later I was moving the washer to remove cat & dog fur and saw the piece. Reinstalled it and the noisy dancing washer was fixed. Sears surplus stores also carry many replacement parts. 11 years of service and still getting the job done after less that a $15 part. My washer brand is a whirlpool Extra-large capacity.This washer is the old type it loads from the top.I don't like this washer because it is to loud.They say it is do to the extra spin cycle.Another family member has the same washer and they are both level it does not help the washer at all.It shakes the whole room. We didn't have enough money to buy the new type of washer.So we had to get this one.I give it a 3 just because it does clean the clothes but the noise factor is a pain.